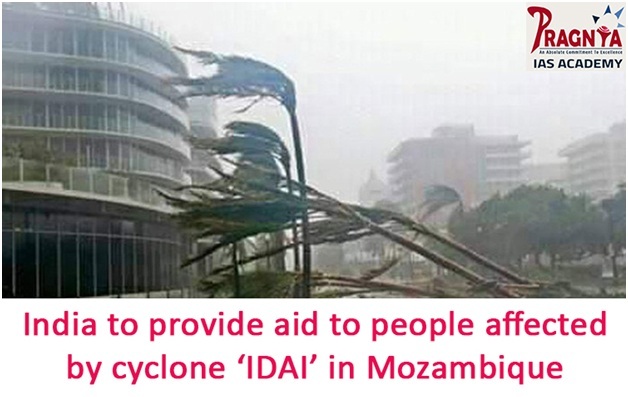 ﻿ India to provide aid to people affected by cyclone ‘IDAI’ in Mozambique. India to provide aid to people affected by cyclone ‘IDAI’ in Mozambique. In the wake of Cyclone Idai which ravaged South African nations of Mozambique, Malawi and Zimbabwe, killing as many as 100, India diverted three naval ships to the port city of Beira in Mozambique to provide immediate humanitarian aid and disaster relief. "We are talking about the loss of lives, at the moment 65 deaths have been confirmed," Sacco told Anadolu Agency. Stressing that death toll could rise in the coming days, Sacco said: "We are worried about an area called Copper where Rusitu and Nyahode Rivers meet and that's where the whole police camp and several government houses were swept away. We don't know where those workers are."